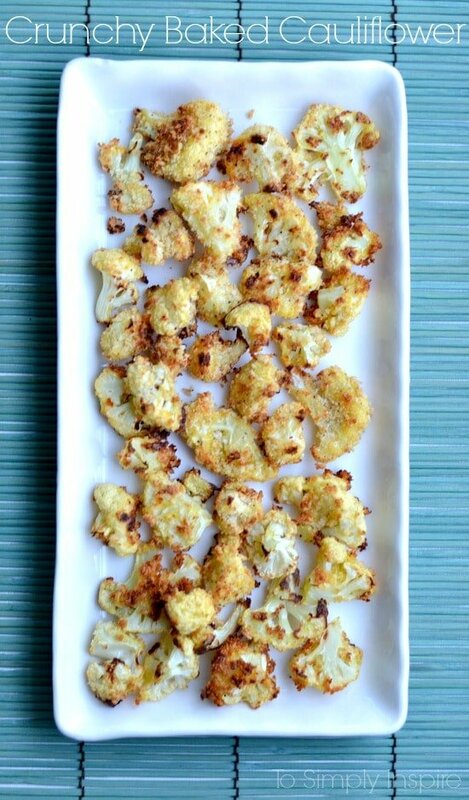 This Crunchy Baked Cauliflower is a healthy little addition to dinner or a fabulous snack too. Simply coated with panko and egg and baked to perfection. My love of cauliflower has grown so much in the past year. 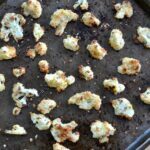 It’s hard to imagine that less than a year ago when I made Roasted Balsamic Cauliflower was the first time I had had “cooked” cauliflower. Then after making the crunchy baked asparagus and it being such a hit, I decided to do the same thing with cauliflower. And, oh boy, this is so delicious too! In a bag, mix panko, garlic powder and pepper. In batches, dip cauliflower into egg and stir to coat. Then drop into breadcrumbs bag and shake to coat. Bake at 400 degrees F for 25-30 minutes, turning half way through. 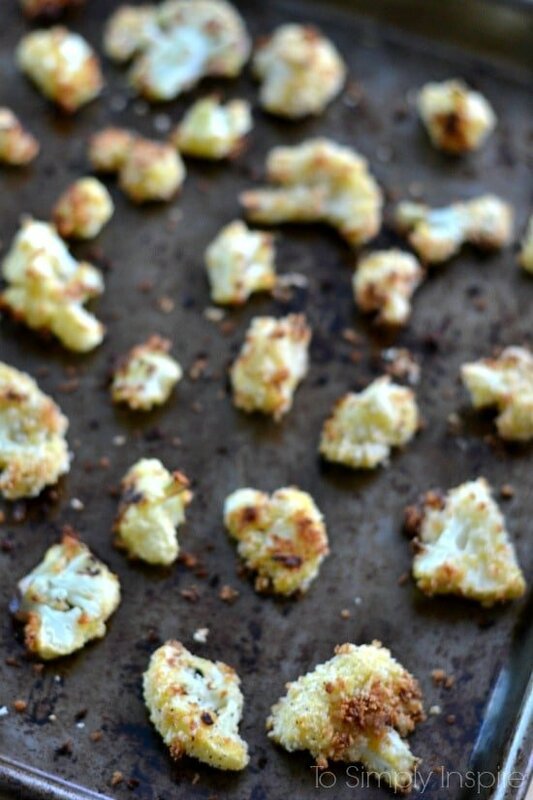 Crunchy Baked Cauliflower is a fun new way to make a healthy side dish. They are great even as an snack! Your cauliflower recipe looks great! Thank you so much for sharing pretty lady. Sounds yummy! I love cauliflower. Thanks for sharing with SYC. I can’t wait to try your awesome Crunchy Treats! Thanks so much for sharing with Full Plate Thursday and have a great week. What a delicious looking side dish!! Thank you for linking up with Friday Favorites, we love having you! This looks mighty tasty. I’ve been working on eating more veggies and this would be a taste treat for sure. So glad you shared with us at Weekend Potluck. Would love for you to link back to the party within your post…it makes you eligible to be featured. Pinning this one! Please come back and party with us again soon. I am going to make this and try it on my Meatless monday at our house ! Thank you! What a great idea! Can’t wait to try it out. Thanks! We don’t give cauliflower respect that it deserves. I love it! Thanks for sharing at Thursday Favorite Things, hope to see you next week again! Happy Easter! oh wow…this looks so good, I love cauliflower….so have to make this for my son. I have to try this Sherri! It looks so delicious and I would be like you, I would eat it before it got to the table! 🙂 Pinning and visiting form The Wednesday Round Up! 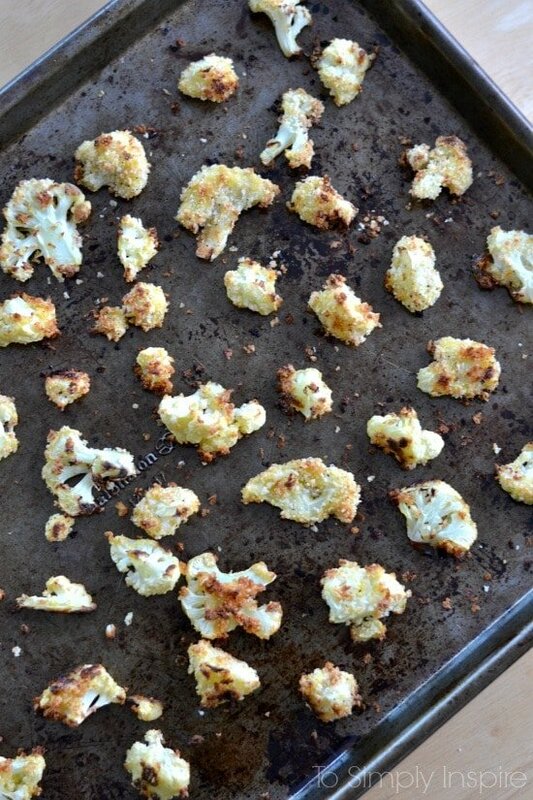 I’ve roasted cauliflower with just some olive oil and garlic, but will have to make them crunchy with panko sometime. I found your recipe over at the Two Cup Tuesday link party. I host Tickle My Tastebuds Tuesday and would love it if you would come over and share this recipe. I’m sure our party goers would love it! Here is the link http://bit.ly/1EylfPQ. This looks YUM! I am a cauliflower fan and will definitely add this to my must try list. I never thought of adding panko, interesting for sure! Thank you for sharing this recipe. Oh yum! I love cauliflower….especially cooked. This crispy version sounds like a winner. Pinning it to try the next time I get some cauliflower! This looks really good! I love cauliflower. Pinning it!